This living room belongs to a Rosemary Beach vacation rental in Florida called “Cottage on the Green.” Christy, who writes the blog Beach Brights, took on the task of furnishing and decorating it. Now it looks lighter, brighter and, well, beachier. It does look beachier! Love the new fan they installed. Now it looks like Florida…….Bright, cheerful & carefree. It feels like the sun is shining inside. Great do over. Well, what a coincidence . . . because I just posted a photo of said-same Rosemary Beach on Facebook. 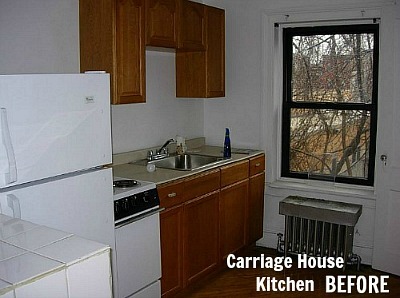 TY for sharing — I’ll definitely have to check out her blog + see if her rentals are pet-friendly! So pretty! I just showed my hubby the pics of the before and after. I have been trying to convince him for the longest time to paint our stained woodwork. I think I finally have him convinced. We will see!! Wow – what a transformation! Beachy-chic, love it! That’s just gorgeous, sunny and bright. 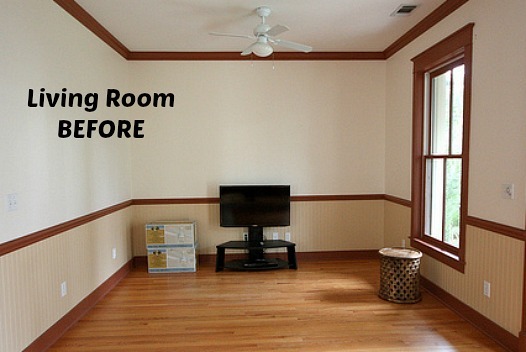 Love what they did to that room, especially deciding to paint the walls and trim white. Makes it look so light and bright which is perfect for a beach theme. The only thing I would add is a little more art or maybe some swirly wrought iron pieces to the TV wall. Christy is one of my (real life) friends and does such LOVELY work! She is brilliant at pulling together spaces and giving them such personality. 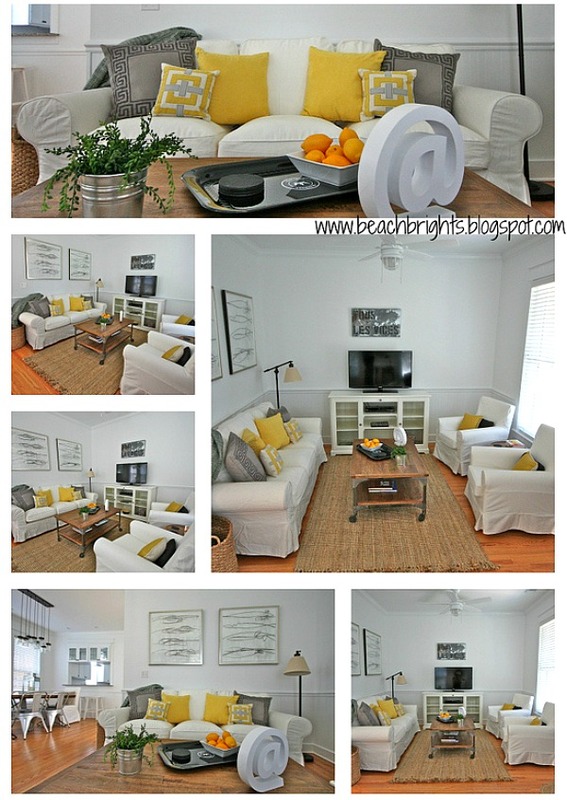 So happy you featured her beach house makeover! So much brighter! I love it! I am sooooo bored and sooooo tired of white on white, I could scream. I have to politely agree. When I think of beachy colors I think of bright beautiful Caribbean colors. The white is very Goldeneye-like. Just not my cup of tea. Very cute. Love her color palette. It looks better for sure. I think a bright colorful rug would make it look even better. The huge “@” is rather odd and out of place. I like the look, especially for a beach house and I’m not usually a fan of yellow either (sadly due to an overdose before a remodel). Funny, I didn’t pay much attention to the “@” and had to take a second look. I just thought it was an unusual piece of art. Everything looks brighter and more relaxing, I personally love the @ sign.Great post! I do, too! I saw one at Home Goods the other day and was tempted to buy it. The white motif somehow gives a relaxing feeling. Very pretty makeover. Somehow I am thinking of giving our beach house a makeover too. I love white on white and never tire of the look — when done someplace like this. It’s the light, that beach reflective light you get anywhere near a beach that makes a look like this pop.